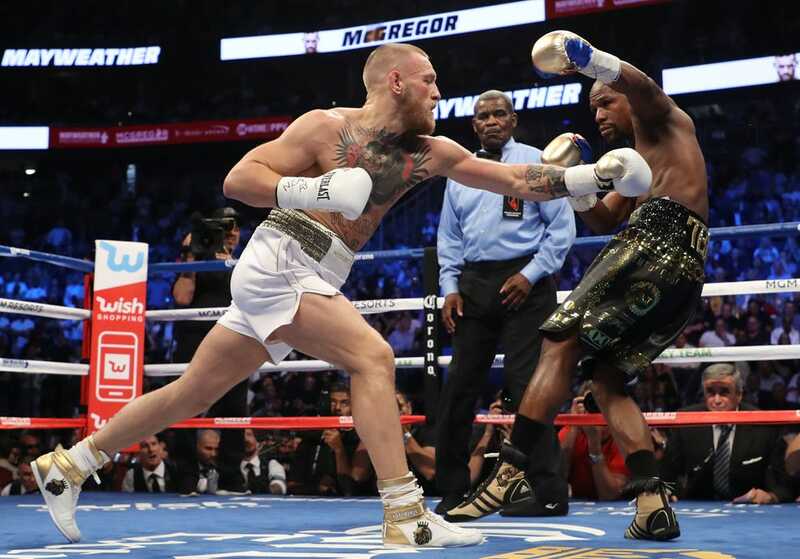 Christian Petersen/Getty ImagesFloyd Mayweather (right) beat Conor McGregor (left) in the tenth round of a boxing rules contest in 2017. Fight expert Joe Rogan says Floyd Mayweather “would literally get killed” if he fought Conor McGregor in UFC. Rogan expects UFC to throw “an ungoldy sum of money” to get Mayweather to fight in a cage. 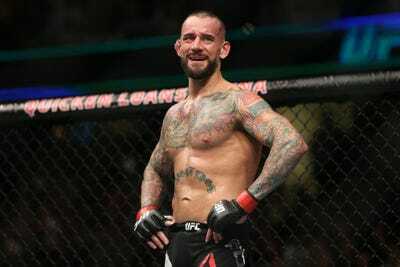 But believes a safer introduction to the sport would be a fight against former WWE star CM Punk. Retired boxer Floyd Mayweather “would literally get killed” if he fought Conor McGregor in UFC, according to commentator and expert Joe Rogan. Rogan, speaking on The Joe Rogan Experience podcast, weighed up the merits of Mayweather – unbeaten in 50 professional boxing bouts – transitioning into UFC. Mayweather became boxing’s first billion-dollar fighter when he defeated McGregor in the 10th round of their boxing rules bout last year. Though he retired after that fight, Mayweather will train alongside UFC welterweight world champion Tyron Woodley in order to prepare for a different challenge – life inside the cage. 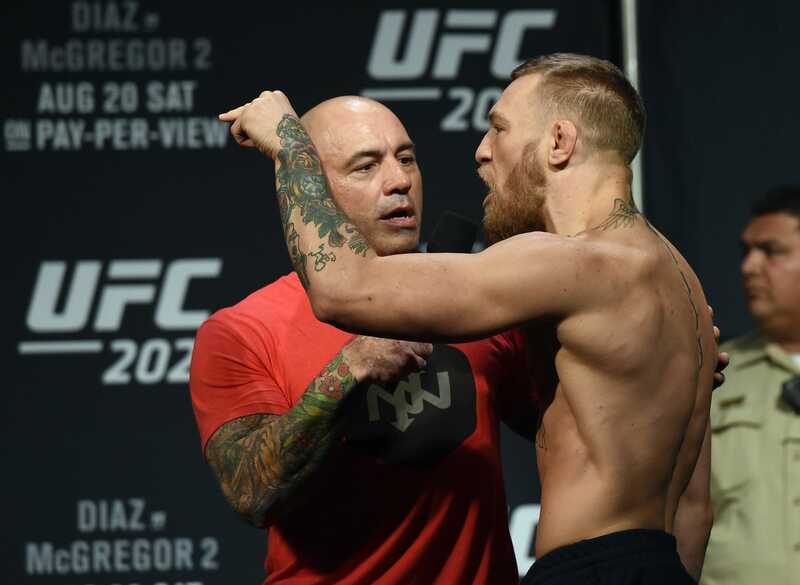 Getty ImagesJoe Rogan (left) is one of the most prominent figures in UFC. Still, despite the fact Rogan believes Mayweather could make $US1 billion if he fought McGregor, he advises against it. “Conor will kick his legs out from under him. He’ll kick his legs sideways, he’ll kick him from the outside, the inside, and he’ll stay the f— away from any range where Floyd Mayweather can punch him,” he said. Later in the podcast, Rogan went as far as to say Mayweather “would literally get killed” if he fought McGregor in UFC. Getty ImagesCM Punk lost his only fight in UFC when he fought Mickey Gall in 2016. Even if Mayweather doesn’t fight McGregor, he could still earn $US500 million for a fight against former WWE star CM Punk, according to Rogan. CM Punk was a two-time WWE Champion, including a 434-day stint reigning at the top of the premier professional wrestling firm, but fought in UFC for a single fight in 2016. He was matched against Mickey Gall and was dominated and choked in the first round. But he thinks Mayweather also has a chance. Mayweather recently said it would take him six to eight months to get ready for UFC but whether he takes on McGregor or CM Punk remains to be seen.